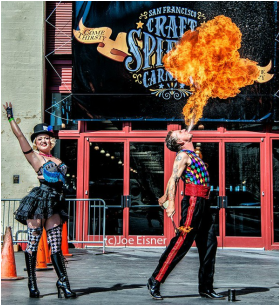 A dynamic thrill show from the heart of the Barbary Coast, San Francisco. Staring Matt Molotov and Dixie DeLish, their vibrant personalities and daring stunts will transport you back in time when burlesque was big time and circus was king. With over 15 years of show experience performing numerous variety acts, these two continue to dazzle audiences near and far. ​ "Oddities: San Francisco" and AMC's "Freak Show," as well as National Geographic, Travel Channel, and Country Music Television.